A cluster of young stars, glowing blue, travels through the red hydrogen gas of a nebula, embedded in an enormous supershell structure. This image of the cluster, NGC 2367, was taken by the MPG/ESO 2.2-meter telescope at the European Southern Observatory's La Silla Observatory in Chile. 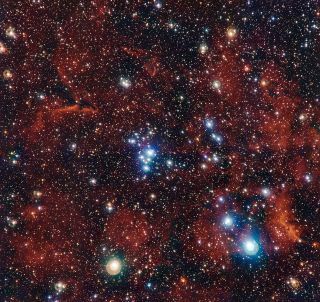 A cluster of blue and white stars glows vividly against the red hydrogen gas of their surrounding stellar birthplace in a new cosmic portrait taken at the European Southern Observatory's (ESO) La Silla Observatory in Chile. Reminiscent of the colors in the American flag, and released just in time for America's Independence Day on July 4 , the image shows open star cluster NGC 2367 and the surrounding hydrogen gas. These objects are embedded in a supershell — an enormous expanding structure out at the edge of the Milky Way. The stars of NGC 2367 are young and hot, and shine with a brilliant blue light. However, this group won't be together long, comparatively speaking: The pull of other clusters and gas nearby will tear them apart over the next few hundred million years. In fact, the sun is believed to have left a similar cluster, according to a statement from ESO. The stars appear against a backdrop of hydrogen gas from the nebula where they were born, which emits light after being energized by the radiation of the stars embedded in it. That nebula is the core of another, larger nebula called Brand 16, which sits inside a vast, rapidly expanding supershell. Supershells stretch for hundreds of light-years; these structures are some of the largest in the galaxy. They form over time as stellar winds and supernova shock waves blast gas into expanding, merging bubbles. This chart shows the constellation of Canis Major (The Greater Dog). Most of the stars visible to the naked eye on a clear night are shown. The location of the bright open cluster, NGC 2367, which can be seen well in a small telescope, is marked with a red circle. NGC 2367 is about 7,000 light-years away from Earth. The cluster appears near the constellation Canis Major (the Greater Dog) in the night sky, and can be seen with a small telescope. This stellar portrait was captured by the Wide Field Imager camera on ESO's 2.2-meter (7.2 feet) telescope at La Silla Observatory in Chile.